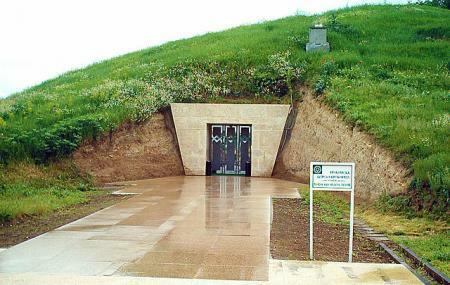 Find hotel near Thracian Tomb Of Sveshtar ..
Thracian Tomb of Sveshtari is a 3rd-century structure built by Thracian people, who were a group of Indo-European tribes inhabiting a large area in Eastern and Southeastern Europe. The tomb is the final resting place of a wealthy Thracian ruler, who was buried here along with his five horses. It was discovered in 1982, and is a typical specimen of Thracian architecture. The unique features of this tomb are the ten female figures carved on the walls here and the decoration in its vault. Find the joy in planning a D.I.Y. trip by using this awesome Alfatar trip planner. Add accommodation and hotels in Alfatar that suit your budget including the most recommended ones like Bratila Family Hotel and Hotel Kantona. Chalk out the best way to discover the city with Alfatar vacation packages. Check out various modes for how to reach Alfatar. Love this? Explore the entire list of places to visit in Alfatar before you plan your trip. Fancy a good night's sleep after a tiring day? Check out where to stay in Alfatar and book an accommodation of your choice. Discovered in 1982 near the village of Sveshtari, this 3rd-century BC. The tomb has a unique architectural decor, with polychrome half-human, half-plant caryatids and painted murals. It is a remarkable reminder of the culture of the Getes, a Thracian people who were in contact with the Hellenistic and Hyperborean worlds, according to ancient geographers. It is incredible how the centuries haven't affected to this treasure. You can visit the tomb only with a guide so be patient awaiting for your group. You cannot take photos so prepare your eyes and your senses. Wonderful archaeological site. The whole tomb has been excavated and preserved. It is a beautiful example of a Thracian tomb. The guide speaks excellent English and explains all the artifacts and gives lots of useful information. Interesting historical place to see. The royal tomb is very well preserved and one can explore the way of building of tombs and also to learn more about the rituals related to the Thracian funerals.